Jakarta, December 18 2015 - In conjunction with favehotel's latest "Get Pink'd" Ad Campaign, the bright and popular brand by Archipelago International is proud to announce the winners of its recent social media photo contest. With the slogan, ‘Pink’d Your Moment' that targeted favehotel's super fans, the contest was held to celebrate the success of the new ad campaign that is attracting more travelers than ever before. 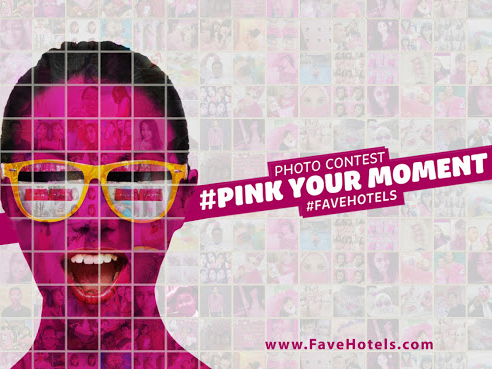 Over 400 applicants participated in the contest by submitting their glowing 'pink'd' photos via Instagram, by tagging @favehotels along with the hashtags #pinkdyourmoment #favehotels #favecontest. The Pink’d Your Moment photo contest was held from 12th November to the 18th November 2015, open to all fans and past, present and future guests. At the end of the competition, judges considered the 10 participants that truly stood out, not only by the amount of pink in each image, but also on their creativity and ability to portray a sense of fun and youthfulness in line with the favehotel brand. The Winners are: @azaleadiah, @devideborasisca, @nafathia, @iinhermawan, @rena_mahda, @yat_yayat, @febyazrian, @ivarvaillant, @ddffpp and @stephanieciel. The 10 lucky winners have won a 3 day 2 night stay at any favehotel property of their choice, whilst their photos will also featured in the favehotel promo video that will air at Cinema XXI locations around Indonesia during movie previews throughout the entire month of December 2015. The video will be aired in 8 different cities such as: Balikpapan, Bandung, Denpasar, Jakarta, Makassar, Semarang, Surabaya and Yogyakarta. “Congratulations to our super fan celebrities! We were blown away with all of the unique ways our guests managed to pink'd their moments. We will definitely continue this campaign and encourage fans to keep sending in their photos in preparation for the next contest” said Tenaiya Brookfield, Vice President Sales & Marketing of Archipelago International. favehotels currently operates 36 hotels throughout Indonesia and Malaysia out of which 12 are in Jakarta and 5 in Bali and has a development pipeline of more than 40 hotels in major cities throughout Indonesia, Malaysia and the Philippines.